Click the thumbnail to download high resolution photos. All Photos by Steven Richard Photography. Brad Bradley* (Bert) is making his Theatre By The Sea debut. Broadway credits: original cast of Spamalot*, People in the Picture*, Annie Get Your Gun* (w/ Bernadette Peters & Reba McEntire) Thou Shalt Not*, Steel Pier* & closing Broadway cast of Billy Elliot. (* denotes original cast album) Brad starred as Patsy on the 1st National Tour of Spamalot." NY/Off Broadway: Chita: A Legendary Celebration, Ernest in Love, A Christmas Carol (MSG), Cocoanuts, Tin Pan Alley. Encores- Strike up the Band & Bye Bye Birdie. 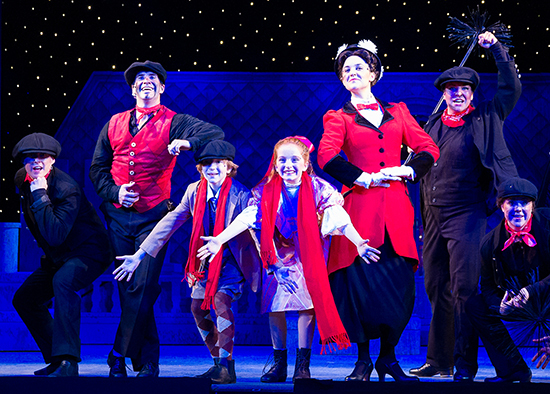 2013 BroadwayWorld Nomination for Spats in Sugar at Sacramento Music Circus. At age 12, Brad was a back up dancer for Michael Jackson in the Pepsi commercial. Brads new solo show B Squared is slowly making the rounds of quaint theatres in the U.S.
James Andrew Walsh* (George Banks) last appeared at Theatre By The Sea 40 years ago--in Mary Poppins! A graduate of Columbia University, James splits his time between Los Angeles and Westerly, RI. James has played leading roles in numerous Off-Broadway shows and National Tours, as well as co-starring feature film and TV roles. James is the co-author of All That Glitters, the Liberace musical opening on Broadway next fall and the writer/executive producer of the upcoming NBC series, "The Gods of Newport." He is thrilled to be back in Matunuck again in this wonderful production. Haley Swindal* (Winifred Banks, u/s Mary Poppins) is thrilled to be making her Theatre By The Sea debut! Broadway: Jekyll and Hyde National tour: White Christmas, Jesus Christ Superstar, I Love a Piano, Jekyll and Hyde; Regional credits: Miss Saigon (Ellen) at North Shore Music Theatre, Annie (Grace) with Sally Struthers at Theatre of the Stars, Westchester Broadway Theatre, Pittsburgh CLO, North Carolina Theatre, and Surflight Theatre. She has performed several times as a soloist at Carnegie Hall with the New York Pops, and just debuted her one-woman show, Play To Win, to a sold-out crowd at Broadway's 54 Below. Haley won a New York Emmy as the host of Kids on Deck, which ran for two seasons on YES Network Television. Love and thanks to Bill, Kevin, and all the Theatre By The Sea family for this opportunity! JP Ferragamo (Admiral Boom/Bank Chairman) is thrilled to be back for his 6th summer season at Theatre By The Sea! Favorite Regional credits: Laughter on the 23rd Floor (Milt), Full Monty (Dave), Hairspray (Edna), Forum (Pseudolus), Forbidden Broadway (Man 2), The Producers (Franz/ Marks), Brigadoon (Charlie), The Sound of Music (Max). NYC credits: Dark of the Moon (Marvin), Dinner at Eight (Dan Packard). Actor & SM at NYC Fringe Festivals. Education: Mannes College of Music & American Academy of Dramatic Arts. Proud member of NATS/SDC/EMC. Thanks to everyone at Theatre By The Sea & love to Steph. Cher Cockshaw (Miss Lark) is happy to return to Theatre By The Sea after making her debut in Grease! Some of her favorite roles include Paulette in Legally Blonde, Lili Vanessi in Kiss Me Kate, Soul Girl in Jesus Christ Superstar. She is currently attending The Boston Conservatory, BFA MT15, where she also appeared in Post Secret Cabaret: BoCo Cares, Broken: A New Rock Musical, and designed and costumed the original musical "Rights of the Living Dead." Hi Mom! Ellen Peterson (Bird Woman/Mrs. Brill) is thrilled to be making her Theatre By The Sea debut! Ellen has enjoyed performing in the Boston area with North Shore Music Theatre, Worcester's Hanover Theatre, Huntington Theatre Co., Reagle Music Theatre, Boston Playwrights', Fiddlehead Theatre Co., Wheelock Family Theatre, SpeakEasy Stage, Lyric Stage, New Rep and Stoneham Theatre. 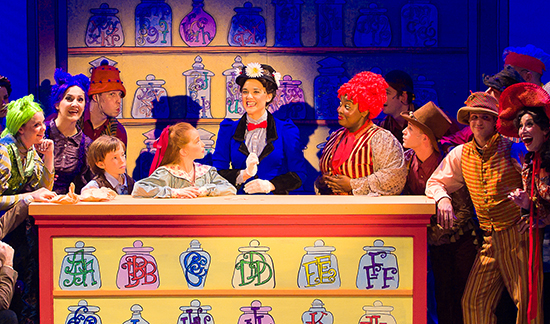 IRNE nominations for Best Supporting Actress-Aunt Eller/Oklahoma! (2012) and Mrs. Brice/Funny Girl (2010). Next up for Ellen- Far From Heaven at Boston's Speakeasy Stage Co.! Bobby Miller III (Michael Banks) is making his Theatre By The Sea Debut! Previous professional credits: Les Misérables (Gavroche) and How I Became A Pirate at Ocean State Theatre; Misérables and The Music Man at Riverside Theatre in Florida. Bobby performed the role of Flounder in Disney's The Little Mermaid, Jr at both Riverside Children's Theatre and the Junior Theatre Festival (Atlanta). Other credits include: Smile, Legally Blonde, Jr., and Annie, Jr. He would like to thank ATB Talent, his vocal coach JP Ferregamo, and Mom. Bobby resides in Cranston and will be a fifth grader this fall. 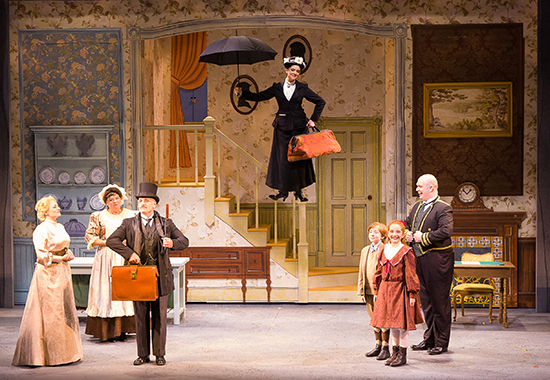 "Living Large"
Scarlett Keene-Connole (Jane Banks) is thrilled to be making her Theatre By The Sea debut as Jane Banks in Mary Poppins. 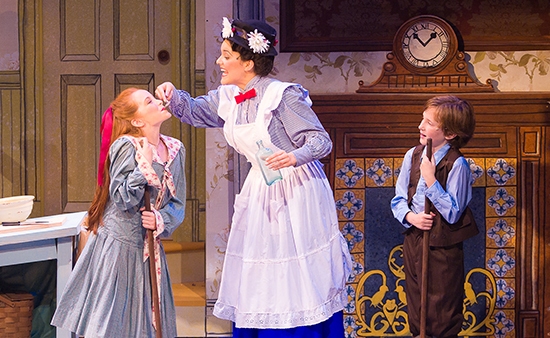 Scarlett's previous roles include Newport Children's Theater's Little Women (Young Amy), Peter Pan (Tinkerbell), Thoroughly Modern Millie, Oliver! 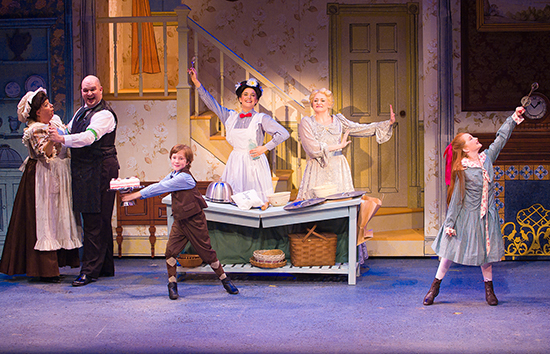 (Fagan's Gang), and as Annie in the Summer 2013 production of Annie. An energetic Aquidneck Islander, when Scarlett isn't on stage, she can usually be found on a lacrosse or soccer field, competing in a swim meet, hockey game or in Narragansett Bay regattas racing her Opti. Sydney Carreiro (Ensemble, u/s Jane Banks) is a 12-year-old life long resident of Somerset, MA. She has enjoyed participating in theatre and dance since the age of four and vocal instruction since the age of nine. Sydney is part of Avalon Agency of NYC and has been seen in numerous community theatre roles including Susan Waverly in White Christmas, Annie in Annie, Baby June in Gypsy, Flounder in The Little Mermaid, Thing 2 in Seussical, and multiple ensemble and featured roles. Sydney just completed her first professional role with the OSTC as Ensemble, u/s Susan Walker in Miracle on 34th Street. Sydney is performing for the first time for Theatre By The Sea and she is extremely excited to be part of Mary Poppins! 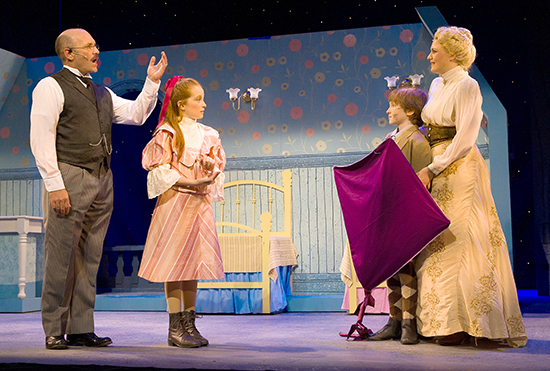 Josh Christensen (Park Keeper, Von Hussler, Ensemble) is very excited to be back at Theatre By The Sea this summer after appearing in last years production of Annie. A Rhode Island native and graduate of the University of RI (B.F.A Theater 2012), Some of Joshua's favorite credits include; Les Misérables, Rent, The King and I, Miracle on 34th Street (OSTC), Master Class (Second Story Theater), and Antigone (La Voce Theater). Thanks to everyone at Theatre By The Sea and, of course, my parents for all their support! Craig Donnelly (Ensemble) Craig is thrilled to be back at Theatre By The Sea after playing Mistoffelees in last season's Cats. Tours: A Chorus Line (Roy, U/S Mike, Mark & Larry) and Cats (Swing). Other regional theater credits include West Side Story (Indio), Tarzan (Flying Ape), Crazy For You (Pete), She Loves Me, Oklahoma! and Seussical the Musical. He would like to thank his family and friends for their unconditional love and support. Alexander Eisenberg (Ensemble) is thrilled to be joining Theater By The Sea this summer! He is currently studying musical theater at the Boston Conservatory. His recent credits include A Separate Peace (Gene), Oklahoma! (Ensemble), La Cage aux Folles (Chantal), Kiss Me, Kate (Paul), and Violet (Monty). He would like to thank Theatre By The Sea, Kevin Hill, Boston Conservatory, and his loving and supportive parents, sisters and twin brother! 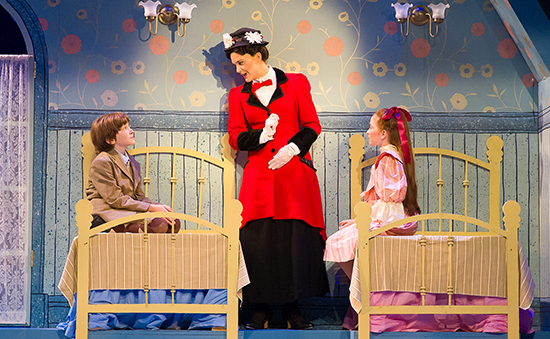 Briana Fallon (Ensemble) is thrilled to be a part of Mary Poppins in her first season at Theatre By The Sea! Regional credits: Singin' in the Rain (New Bedford Festival Theatre), Bye Bye Birdie (Reagle Music Theatre). She is a rising senior at The Boston Conservatory (credits include: Oklahoma!, Legally Blonde, Zombie Prom, and Thoroughly Modern Millie). She would like to thank Kevin, and her family and friends for the love and support! Joseph Fierberg (Valentine, Ensemble, u/s Robertson Ay) is making his Theatre By The Sea Debut! Previous credits: Mary Poppins at Maine State Music Theatre (East Coast Regional Premiere) as well as Mary Poppins and Young Frankenstein, both at the Fulton Theatre; Thoroughly Modern Millie (Ogunquit Playhouse); Seven Brides for Seven Brothers (Arizona Broadway Theatre); White Christmas (Syracuse Stage); Mark in A Chorus Line; Cosmo in Singin' in the Rain, Dennis in All Shook Up (Interlakes Theatre); Snoopy in You're a Good Man, Charlie Brown (Playhouse on Park). B.F.A. : Syracuse University. Big thanks to Kevin, Bill, the folks at Theatre By The Sea and, always, my family. Sara Gallo (Ensemble) is thrilled to be returning to Theatre By The Sea after making her debut with Grease! A Philadelphia native, Sara is currently pursuing her BFA in Musical Theatre at the Boston Conservatory, where she will be a junior this fall. Recent conservatory credits include Hair (Crissy), Oklahoma!, and Zombie Prom (Candy). Sara would like to thank everyone at Theatre By The Sea for this amazing experience and her family and friends for their love and support. For my monkey. Daniel Gold (Ensemble) is overjoyed to return to Theatre By The Sea after making his debut in Grease! Daniel left New Jersey to pursue his BFA in Dance at the Boston Conservatory. He recently performed in Boston Conservatory's dance main stage Limitless! Outside the conservatory he has been performing in The Donkey Show (Mustardseed) at American Repertory Theatre. Daniel is extremely thankful to the creative team and outstanding cast for this experience and thanks his family and friends for their constant support! Alexander LeBlanc (Ensemble, u/s Michael Banks) is 12 years old from East Greenwich, RI, and is thrilled to be performing at the historic Theatre ByThe Sea. Professional credits include Trinity Repertory Company's Oliver!, ( Thief Fagin's Gang/ Orphan), Trinity Repertory Company's A Christmas Carol (Turkey Boy) and Ocean State Theatre Company's The King and I (Royal Child). Other favorite roles include, Ugly in Honk Jr., Thomas O'Malley in The Aristocats, and the Wizard in The Wizard of Oz. Alex enjoys playing the piano and the alto saxophone. All my love to Mom, Dad, and Victoria. Special thanks and love for the support and transportation services to Mimi and Memere. Love and gratitude to my ever-patient vocal instructor, Mrs. Lisa Buckley. Adam Pearce (Northbrook, Ensemble) Adam is originally from London and his Mother is a real life Cockney! He graduated from AMDA last year. Previous work includes: A Christmas Carol (Tour), S'wonderful (NJ), I Do Wonder (NYC), Watson (PA) and Pocahontas (RI) and in London: Me & My Girl, Mack & Mabel and Pirates of Penzance. follow Adam: @MrAdamPearce. Brad Trump (Neleus, Ensemble) is thrilled to be returning to the stage at Theatre by the Sea after performing in last year's production of Cats. National Tour: Cats (Tumblebrutus). Regional Theatre: Cats, Oklahoma!, Joseph...(Benjamin), A Music Box Christmas at Hershey Park (Billy) and Jesus Christ Superstar: In Concert. Film: Perks of Being a Wallflower, Lovestruck! The Musical. Richard M. Sherman & Robert B. Sherman (Original Music & Lyrics). Honors include two Oscars® (Mary Poppins), nine Oscar® nominations, three Grammy® Awards, 24 gold/platinum albums, a star on Hollywood's Walk of Fame and induction into the Songwriters Hall of Fame. Early hits, including "You're 16" and "Tall Paul," led to a long-term association with Walt Disney and more than 150 songs for Disney films, TV and theme parks ("It's A Small World" being the world's most translated and performed song). Their Disney film credits include The Jungle Book, The Parent Trap, Bedknobs And Broomsticks, Winnie The Pooh, The Aristocats and The Tigger Movie. Other films: Chitty Chitty Bang Bang, Tom Sawyer, The Slipper And The Rose, Charlotte's Web and Beverly Hills Cop 3. Stage credits include Over Here!, Chitty Chitty Bang Bang (London, Broadway, UK tour), Busker Alley, Mary Poppins (London and Broadway). Julian Fellowes (Book). A British, Oscar®winning screenwriter, Julian is also an actor and director. He studied at Ampleforth College, York shire and Magdalene College, Cambridge. His first script for cinema, Gosford Park (2001), won him the Best Original Screenplay Oscar®, plus honors from the Writers Guild of America, among others. He received the National Board of Review's Best Directorial Debut Award for the film Separate Lies, based on his own screenplay. He most recently wrote and directed the feature film From Time To Time starring Maggie Smith. His other projects include the books Snobs and Past Imperfect, the television series, "Downton Abbey," and the scripts for "Vanity Fair," "The Young Victoria'" and "The Tourist." Bert Scott (Scenic Design) is happy to return to Matunuck for a fifth summer after designing scenery for La Cage aux Folles, Annie (2013), 9 to 5: The Musical (2012), Hairspray (2011), and Little Shop of Horrors (2010), and lighting for The Sound of Music (2012). Bert has been the resident scenic and lighting designer since 2001 for the Off-Broadway company Theatre Breaking Through Barriers; other credits include Stages St. Louis, The Carolina Theatre, Theatre West Virginia (nine seasons as resident designer), The Opera Company of Philadelphia, North Shore Music Theatre (Beverly, MA), Ocean State Theatre Company (Warwick, RI), Theatre By The Sea (Matunuck, RI) The Mark Twain Playhouse (Branson, Mo. ), The Orlando Rep, The Orlando Shakespeare Theatre, Nickelodeon (numerous versions of Dora the Explorer, Live! and SlimeTime Live! ), and Norwegian Cruise Lines. Bert is a tenured associate professor of Theatre and coordinator of the Theatre Design & Technology training programs at the University of Central Florida in Orlando. He holds a BS in Electrical Engineering from Virginia Tech, and MFA in Theatre Design From the University of North Carolina-Greensboro and is a member of United Scenic Artists. Kurt Alger (Costume Design). Maine State Music Theatre: Costume Designer: Les Misérables, Gypsy, Mary Poppins,42nd Street, Legally Blonde, The Marvelous Wonderettes, Xanadu, The Wiz, Always...Patsy Cline, Chicago, Spamalot, JCS, Light in the Piazza and Drowsy Chaperone. Wigs: Producers, All Shook Up, Les Misérables, West Side Story, Thoroughly Modern Millie, Grand Hotel, Hairspray. Kurt has traveled the country and the world as head of Wardrobe on Rent, Hairspray, and the 25th Anniversary Tour of Les Misérables. Resident theaters include Fulton Theatre, Ogunquit Playhouse, Pennsylvania Shakespeare, Orlando Shakespeare, Snug Harbor Cultural Center, Riverside Theatre, Beef and Boards and Drury Lane. NYC credits include NTMTF Best of Fest winners Caligula, Such Good Friends, Things As They Are, and Les Enfants de Paris, and work on the Off-Broadway smash hit Shockheaded Peter! Kurt designed and produced the world premiere of Born Blue. Other: A graduate of Wagner College in NYC he has also worked designing at the academic level at Julliard, NYU, Wagner College, and University of Southern Maine. Marianne Coleman (Wig Design) started at Theatre By The Sea, doing costumes, back when Tommy Brent was the producer and has done wigs occasionally since 1999. She started her wigging at Hartford Stage Company, and has worked for Trinity Repertory Company, Yale Rep, Goodspeed Opera House , 2nd Story Theater as well as local colleges and community theater groups. She teaches the dying art of styling and making wigs for theater at Rhode Island College. Glad to be working on Mary Poppins! ZFX, Inc. (Flying Effects) is a complete provider of flying effects for everything from schools to Broadway to the event industry, collaborating with clients to create safe and awe-inspiring flying effects for audiences around the globe. Famed for their creativity, ZFX is also a technical powerhouse, designing and manufacturing all equipment, harnesses and blackened wire rope in-house. Their user-friendly rigging and technical solutions, combined with exceptional artistic insight, provide an unparalleled service which sets the industry standard. Eileen F. Haggerty* (Production Stage Manager). Broadway: Spider-Man Turn Off The Dark (Assistant Creative Consultant/ Assistant Director), The Boy from Oz, Fosse. International : Ben Hur Live. Off-Broadway : Flamingo Court; Tours: Blast!, Contact, The Wizard of Oz, Goosebumps: Live On Stage, Ringling Bros. and Barnum & Bailey, Barnum's Kaleidoscape. Regional: Sister Act The Musical (Pasadena Playhouse/ Alliance Theatre world premiere), Theatre By The Sea (Hello, Dolly! ), Paper Mill Playhouse, TheatreVirginia, York Theatre, North Carolina Theatre, Model Secondary School for the Deaf - Performing Arts. Television: Great Performances' "Crazy for You". With gratitude to my family and Kevin, Maureen and Eddie. Proud member of Actors' Equity Association. Michaela Brown (Assistant Stage Manager) is thrilled to make her debut with Theatre by the Sea. She is a Temple University graduate with a BA in Theatre. Her previous credits include The Trestle at Pope Lick Creek, Higgins in Harlem [World Premier], Lend Me a Tenor, The Hound of the Baskervilles (Playhouse on Park); Buried Child and Tartuffe (Temple Repertory Theater); The Temperamentals (Mauckingbird Theater); The Suicide (Brown/Trinity Repertory MFA Program); and The Taming of the Shrew (Colonial Theater's Shakespeare in the Park. She would like to thank her family and friends for all of their continuing love and support. Bill Hanney (Owner/Producer) began his career in show business at age 19, leasing and developing movie theaters, including his first multiplex in Quincy, Massachusetts. Before long, he was booking rock shows (Jefferson Starship, Rush) and other types of live entertainment, which eventually led to the presenting and producing of Broadway productions. One such show was an appearance by the legendary mime artist, Marcel Marceau. As president of Broadway Productions, Bill presented national tours such as Annie, Amadeus, Dancin', Peter Pan, Rocky Horror Show and Mark Twain starring Hal Holbrook, throughout New England including Worcester, Springfield, Portland, Maine and Boston. Aside from his work reopening Theatre By The Sea in 2007, one of Bill's crowning achievements was the 2010 purchase and re-opening of North Shore Music Theatre, a landmark 1,500 seat professional theatre, which is now in its fifth successful year of operation in Beverly, MA (nsmt.org). Throughout his career, Bill has stayed focused on his movie theatre chain having bought, built, owned, operated and sold more than 30 cinemas. His company, Entertainment Cinemas, currently operates ten movie complexes in four states. In 2009, Bill was elected President of the Theatre Owners of New England. Bill's ongoing work to re-open NSMT inspires him to consider acquiring additional performance venues at which he plans to someday share his productions between his theatres. Bill is a member of the League of Broadway Producers and is currently a Lead Producer on the Broadway-bound revival of Sugar Babies. Bill has been named to the North Shore Top 100 by the North Shore Chamber of Commerce. In 2012 he was recognized by both the Beverly Chamber of Commerce and Salem Chamber of Commerce as Business Person of the Year. In addition to his work with North Shore Music Theatre and Theatre By The Sea, Bill is involved in the Broadway revival of Pippin at the Music Box Theatre. Bill is looking forward to his continued work on the 2014 Season at Theatre By The Sea. Music Theatre International (MTIShows.com) is one of the world's leading dramatic licensing agencies, protecting the rights and legacy of composers, lyricists and book writers and supplying scripts, musical materials and other theatrical resources to theaters around the world. 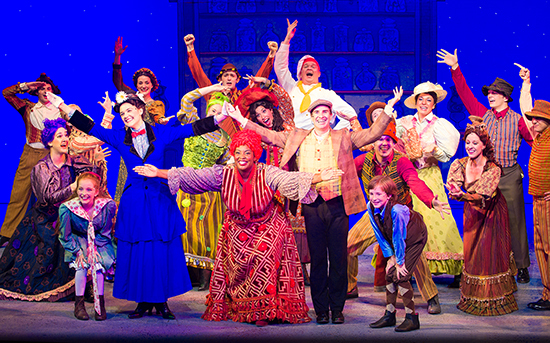 MTI has been a driving force in extending the production life of such great musicals as Annie, Guys and Dolls, West Side Story, Damn Yankees, Fiddler on the Roof, The Music Man, Ragtime, as well as Mary Poppins. 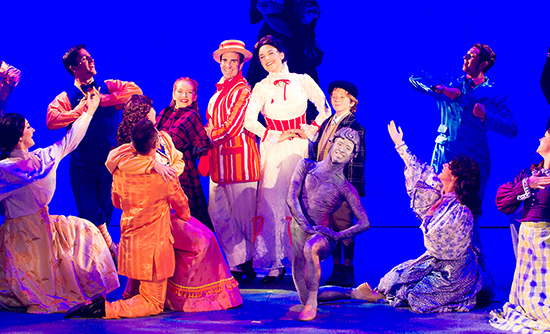 With more than 250 titles in its catalogue, including hits from the Broadway and London stage, musical revues, the Broadway Junior Collection and other youth musicals, MTI shows have been performed by more than 45,000 amateur and professional theatrical organizations throughout the U.S. and in over 60 countries around the world. Theatre By The Sea (www.theatrebythesea.com), which is on the National Register of Historic Places, has had many incarnations over the years. The property was purchased by the Tyler family in the early '20s. After Alice Tyler was left a widow with three young children, she ran the property as a summer camp for girls. When the depression hit, she decided to create jobs and provide a future for her children by turning the barn into a theatre. The 300-seat theatre opened on August 7, 1933 with a production called Strictly Dynamite. That initial season lasted four weeks and featured four different plays, one of which was taken to New York. In 1938, a Yale Cooperative took over. Then, on September 2, a hurricane hit. The back wall of the theatre caved in and the stage roof was blown off. During the repairs, the theater was expanded to include a balcony. The newly enlarged theatre operated through 1941 and then went dark during the war. In 1946, the theatre's most glamorous and star-filled period began. The theatre became what is referred to as a "star-system" house opening with a show called Dream Girl which starred Judy Holliday. Other headliners who were brought in were Tallulah Bankhead, Mae West, Groucho Marx and Marlon Brando. Following the 1958 season, the property was sold to the Bontecou family, who leased it sporadically for several years, and by 1966 there were plans to tear down the theatre. Upon hearing that the theatre was to be destroyed, Tommy Brent, who had previously worked as a publicist for the theatre, returned and saved the theater from demolition. His first show opened on June 23, 1967 and he ran the theatre successfully for 22 years. In 1988, FourQuest Entertainment, which consisted of Laura Harris, (who had previously worked at the theatre for 11 summers), Renny Serre and Richard Ericson, came on board. Following extensive renovations, FourQuest reopened the theater in the spring of 1989 and continued producing high quality summer theater in Matunuck until the fall of 2003. The theatre went dark once again until 2007, when entrepreneur Bill Hanney purchased the property and, with producing partners, successfully mounted a production of A Funny Thing Happened on the Way to the Forum, just six weeks later, reopening the historic theatre on August 8, 2007. 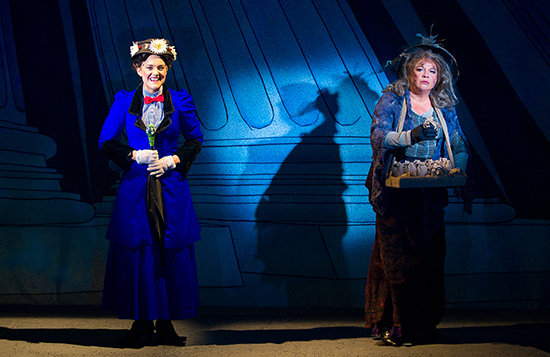 Theatre By The Sea continues to produce a successful four-musical subscription season annually.